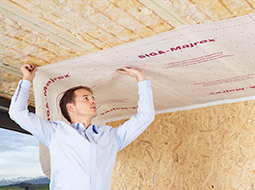 The new SIGA Majrex® ensures better safety for timber constructions even when moisture levels are high, for example after screed has been laid or when walls are freshly plastered, and also when the structure is subjected to extreme moisture during use. Thanks to Hygrobrid® technology, moisture development within the structure is minimised and moisture transport out of the structure is maximised. Smart membranes adjust their permeability based on the moisture content in the air. In areas with a high relative humidity, the membrane will open up and allow this moisture to enter or escape. This reaction to the humidity, no matter on which side of the membrane, is exactly the problem. In a lot of areas during construction, we see high humidity levels inside to which the "smart" membrane reacts and becomes more permeable to moisture and allows it to pass into the wall cavity, where it is not meant to be. What this means is these vapor variable membranes are not as smart as you think. Increased safety in every construction. 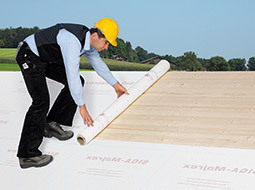 Majrex is ideal for installation in flat and inclined roofs. 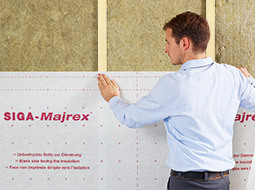 Airtight sealing of Majrex vapour control layer overlaps with Sicrall 60. Can be used for above-rafter insulation. 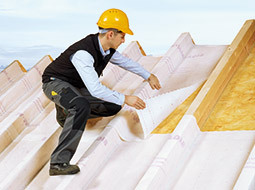 Majrex is ideal for roof renovation from the outside.